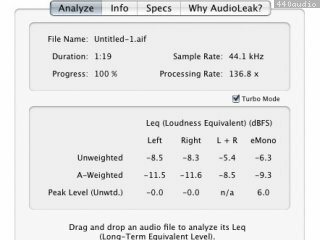 AudioLeak allows quickly (over 200 times realtime on newer Macs) and easily previewing the relative (perceived) playback volume of sound / music files without having to listen to them. 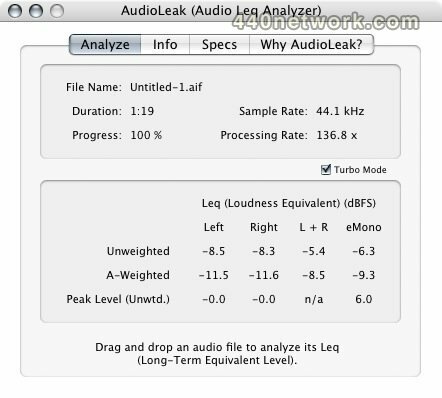 Various compressed and uncompressed audio formats are supported, of any sample rate and file size. Shows Average unweighted RMS, A-Weighted RMS and Peak values. Updated use of nomenclature to eliminate confusion between RLB and R2LB ﬁlter. Corrected minor issue that prevented real-time mode on Intel Macs. Did not affect file analysis mode. Graphing of analysis results: RMS, Peak, histogram, Peak Check. Real-time input mode (can run concurrently with file analysis). It's a very nice little app.